Have you ever thought that Aquaponics might be something that you would like to try, but you thought that you would like to try to design your own system? Even if you already know a bit about Aquaponics, this workshop will give you a much more solid grasp on the specific mechanics of how to appropriately design systems and make them run as efficiently as possible. In this workshop, we will have over SEVEN HOURS of instruction where we will cover the information that you will need to go home and design your own custom Aquaponic system. 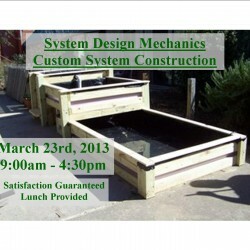 During the morning session we will cover our “System Design Mechanics” and an abbreviated version of our “Advanced Aquaponics” curriculum (detailed below), and then we will have lunch with an informal Q&A to discuss some of the tricks we have developed relating to Aquaponic system design. The afternoon session will be a hands-on construction opportunity to build a portion of the Winston Outdoor System, to demonstrate the techniques necessary to efficiently build using lumber levitra price list and pond liner. Specifically, this system is a 4’ x 12’ integrated hybrid system that includes a 180 gallon Fish Tank, 16 sqft of Media Bed, and 32 sqft of DWC Raft Bed. Hands-on construction of system components.